The throat or pharynx is located behind the nose and the mouth and is connected to both of them. It is a muscular tube that carries both food and air. As it goes down, it splits in two passages the esophagus and the larynx. The esophagus is the tube that goes from the throat to the stomach. It carries food and drink. The larynx carries air. 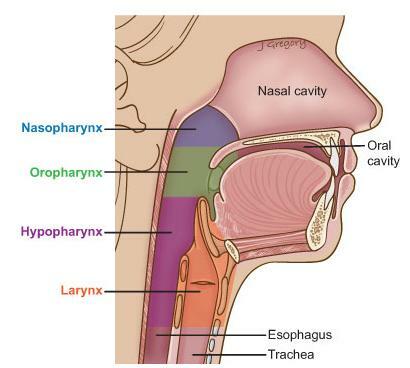 The larynx also contains the vocal cords which produce sound, allowing us to speak. Air passes through the larynx into the trachea and then into the lungs. The tonsils are located on both sides of the back of the mouth in the throat and the uvula is a small flap of tissue visible in the back of the throat between the tonsils. It varies in length. 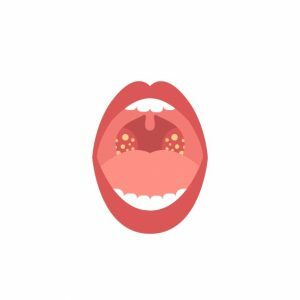 As part of the soft palate, the uvula helps prevent food and fluids from entering the nasal cavity during swallowing and assists in the formation of certain sounds during speech. A long uvula may cause snoring and occasionally contributes to obstructive sleep apnea. How tonsillitis is diagnosed, what are tonsillitis symptoms? Diagnosis of acute tonsillitis is based on a physical examination of throat. The doctor may be taking a throat culture by gently swabbing the back of throat. The culture will be sent to a laboratory to identify the cause of throat infection. Who Needs Tonsillectomy (tonsils surgery or tonsil removal)? Laryngitis is inflammation (swelling) of your larynx and is usually caused by a virus. Vocal cord polyps are often the result of an acute injury (such as from shouting at a football game) and typically occur on only one vocal cord. Polyps may have several other causes, including gastroesophageal reflux, or chronic inhalation of irritants (such as industrial fumes or cigarette smoke). Polyps tend to be larger and bulge out more than nodules. Polyps are common among adults. 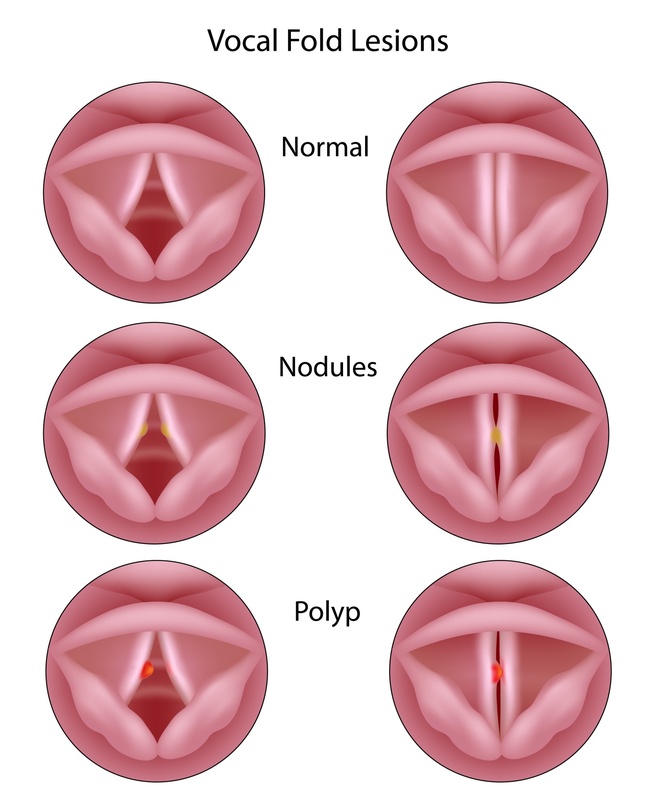 Vocal cord nodules occur on both vocal cords and result mainly from chronic abuse of the voice (habitual yelling, singing, or shouting or using an unnaturally low frequency). Nodules can occur in children. Vocal cord granulomas are often the result of vocal cord injury due to uncontrolled gastroesophageal reflux (GERD) or damage during endotracheal intubation (insertion of a plastic breathing tube through the mouth into the trachea. Granulomas are common among adults. Treatment relies on avoiding whatever is irritating vocal cords and voice rest. If abuse of the voice is the cause, voice therapy conducted by a speech therapist may be needed to teach the person how to speak or sing without straining the vocal cords. 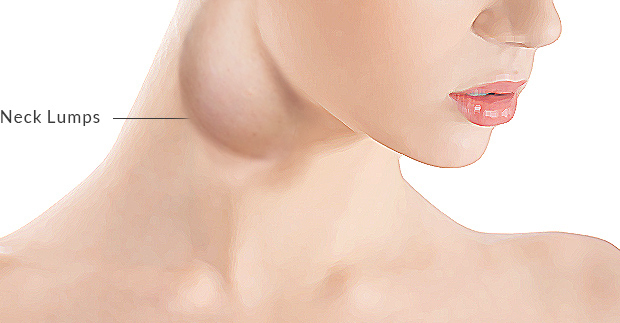 Abnormal swelling or lump in the neck may be discovered by a patient or by a doctor during an examination. Neck lumps may be painful or painless depending on what has caused them. Painless neck lumps may be present for a long time before people notice them. Most neck lumps are enlarged lymph nodes, however it may be congenital cyst or an enlarged salivary gland or an enlarged thyroid gland. What is the doctor is going to do for diagnosis? The diagnosis is based on physical examination during which pencil size flexible scope with camera will be introduced to the throat and larynx. Ultrasound for neck, CT scan, MRI and Ultrasound Guided Fine Needle Aspiration and cytology may be requested. 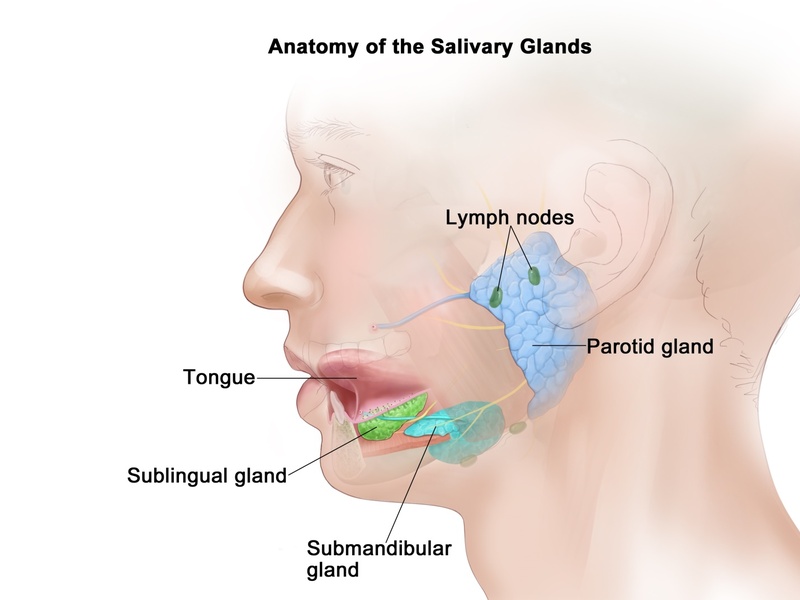 The parotid glands, the largest pair of salivary glands, lie just behind the angle of the jaw, below and in front of the ears. The sublingual glands and the submandibular glands, the two smaller pairs, lie deep in the floor of the mouth. In addition to these major glands, many tiny salivary glands are distributed throughout the mouth. All of the glands produce saliva, which aids in breaking down food as part of the digestive process. Several types of disorders affect the salivary glands such as stones, infection, and swelling. A stone can form from salts contained in the saliva. 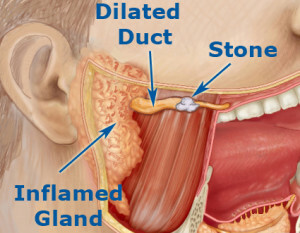 Salivary stones create problems when they block the tube (duct) that carries saliva from the gland to the mouth. Blockage makes saliva back up inside the duct, causing the salivary gland to swell painfully. The pain and swelling worsen after eating because saliva production will be increased, the duct is blocked, the saliva has no place to go and the gland swells. The swelling may go down after a few hours. A blocked duct and gland filled with stagnant saliva may become infected with bacteria. Most salivary gland infections occur in people who have something that blocks the flow of saliva (such as a stone) or who have very low flow of saliva. Infection is most common in the parotid gland .Sometimes a collection of pus (abscess) forms in the gland, and a small amount of pus comes out of the duct of the gland. The infected gland is swollen and very painful. Swelling will be due to infections or stones or also can result from cancerous (malignant) or noncancerous (benign) tumors in the salivary glands. How is salivary Gland Diseases Treated? Treatment of salivary gland diseases falls into two categories: medical and surgical. 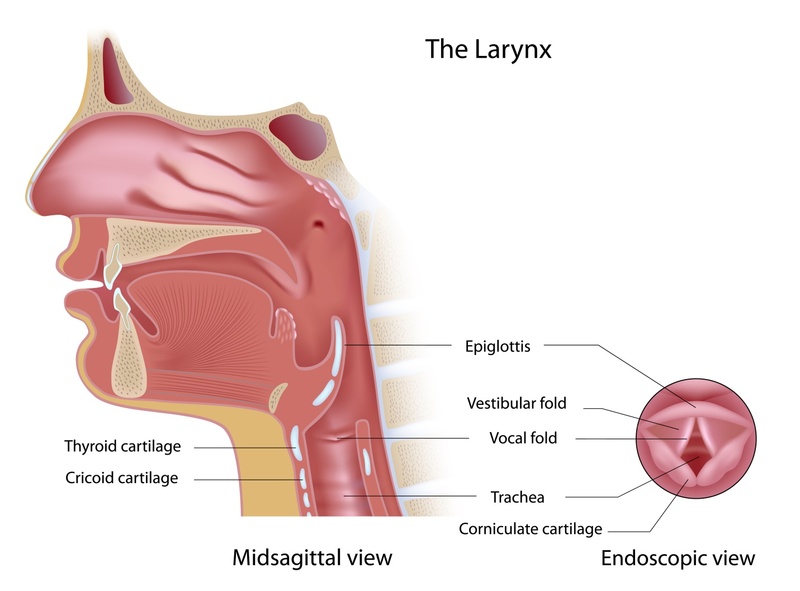 It is a commonly performed procedure in the otolaryngologist’s office and serves as an objective diagnostic tool in the evaluation of nose, nasopharynx, pharynx, larynx and vocal cords. The test takes about 5 to 10 minutes. Medicine will be put inside your nose and in your mouth to numb the area, after that the endoscope will be inserted into your throat. This is a long flexible tube with a camera at the end; Pictures may be projected onto a screen. Laryngoscopy may be accomplished with either a flexible fiberoptic endoscope from the nose or with a rigid laryngoscope form the mouth. When performed by experienced practitioners, both flexible endoscopy and rigid endoscopy are usually well tolerated.